The Crossover 87L is your best bet for a week-long ski vacation. The Crossover 87L is your best bet for a week-long ski vacation. A lightweight, but sturdy frame, smooth-rolling wheels and multiple compartments make it an excellent choice for ski travel. Like many large rolling duffels, the Crossover has a main compartment divided by a zippered mesh panel. This makes it easy to keep ski or snowboard boots on the bottom along with outerwear or dirty clothes while your clean gear and nicer clothes stay separate up top. Unlike other large split-level duffels, you can access the top compartment when the bag is opened up via the zippered mesh panel OR when the bag is closed through the wide mouth on the top. Another unique feature of this bag is the heat-molded, crush-proof SafeZone™ compartment that’s accessible from the outside of the bag and keeps sunglasses, goggles or electronics safe from harm. The SafeZone™ compartment can be locked off and even removed if you need extra cargo room. Despite it’s lightweight exoskeleton frame, the Crossover 87L is super durable. It’s made out of water resistant fabrics and features aluminum hardware throughout. The oversized wheels and the V-Tubing™ telescoping handle keeps the bag extra sturdy and prevents swaying from side to side. 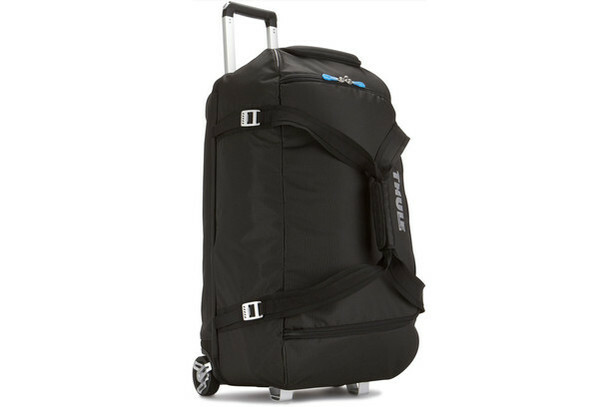 So, look no further than this sleek rolling duffel if you need a bag to store a week’s worth of ski gear and boots.